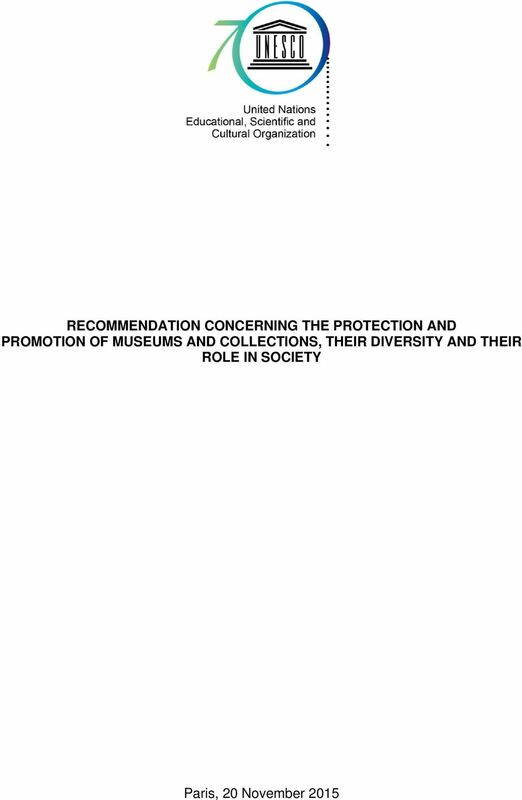 Download "RECOMMENDATION CONCERNING THE PROTECTION AND PROMOTION OF MUSEUMS AND COLLECTIONS, THEIR DIVERSITY AND THEIR ROLE IN SOCIETY"
5 not normally visit museums. Museum actions should also be strengthened by the actions of the public and communities in their favour. Education 12. Education is another primary function of museums. Museums engage in formal and non-formal education and lifelong learning, through the development and transmission of knowledge, educational and pedagogical programmes, in partnership with other educational institutions, notably schools. Educational programmes in museums primarily contribute to educating various audiences about the subject matters of their collections and about civic life, as well as helping to raise greater awareness of the importance of preserving heritage, and fostering creativity. Museums can also provide knowledge and experiences that contribute to the understanding of related societal topics. III. 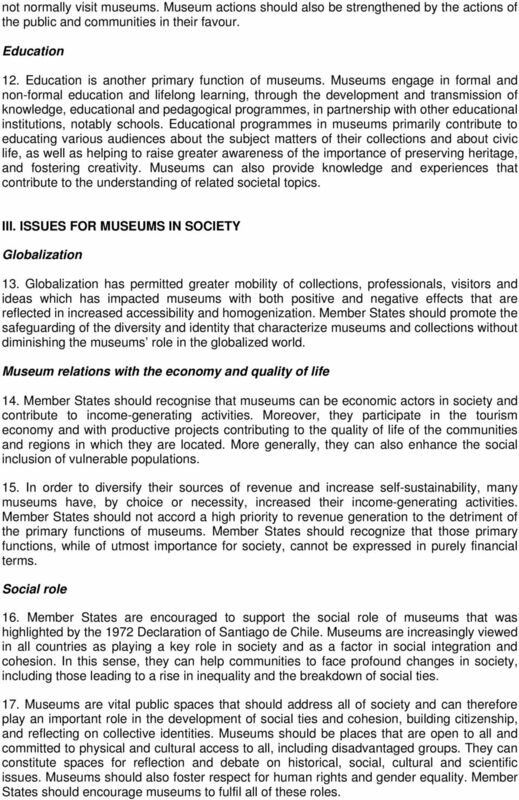 ISSUES FOR MUSEUMS IN SOCIETY Globalization 13. Globalization has permitted greater mobility of collections, professionals, visitors and ideas which has impacted museums with both positive and negative effects that are reflected in increased accessibility and homogenization. Member States should promote the safeguarding of the diversity and identity that characterize museums and collections without diminishing the museums role in the globalized world. Museum relations with the economy and quality of life 14. Member States should recognise that museums can be economic actors in society and contribute to income-generating activities. Moreover, they participate in the tourism economy and with productive projects contributing to the quality of life of the communities and regions in which they are located. More generally, they can also enhance the social inclusion of vulnerable populations. 15. In order to diversify their sources of revenue and increase self-sustainability, many museums have, by choice or necessity, increased their income-generating activities. Member States should not accord a high priority to revenue generation to the detriment of the primary functions of museums. Member States should recognize that those primary functions, while of utmost importance for society, cannot be expressed in purely financial terms. Social role 16. 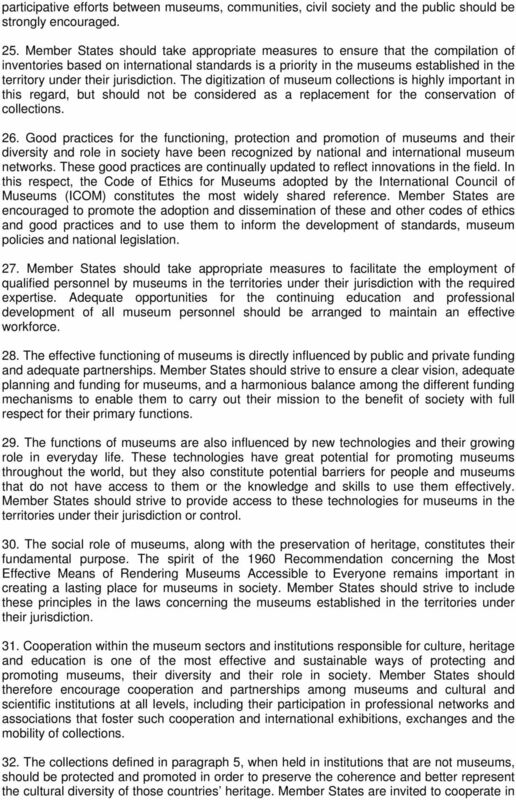 Member States are encouraged to support the social role of museums that was highlighted by the 1972 Declaration of Santiago de Chile. Museums are increasingly viewed in all countries as playing a key role in society and as a factor in social integration and cohesion. In this sense, they can help communities to face profound changes in society, including those leading to a rise in inequality and the breakdown of social ties. 17. Museums are vital public spaces that should address all of society and can therefore play an important role in the development of social ties and cohesion, building citizenship, and reflecting on collective identities. Museums should be places that are open to all and committed to physical and cultural access to all, including disadvantaged groups. They can constitute spaces for reflection and debate on historical, social, cultural and scientific issues. Museums should also foster respect for human rights and gender equality. 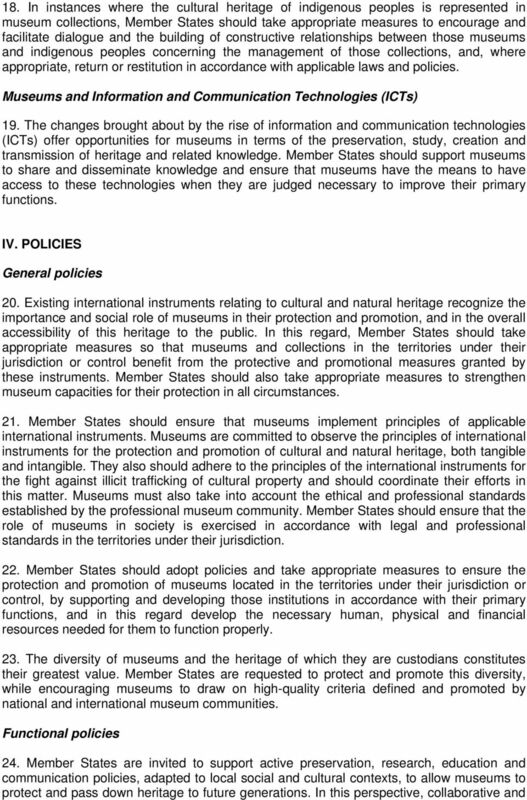 Member States should encourage museums to fulfil all of these roles. 8 the protection, research and promotion of those collections, as well as in promoting access to them. 33. 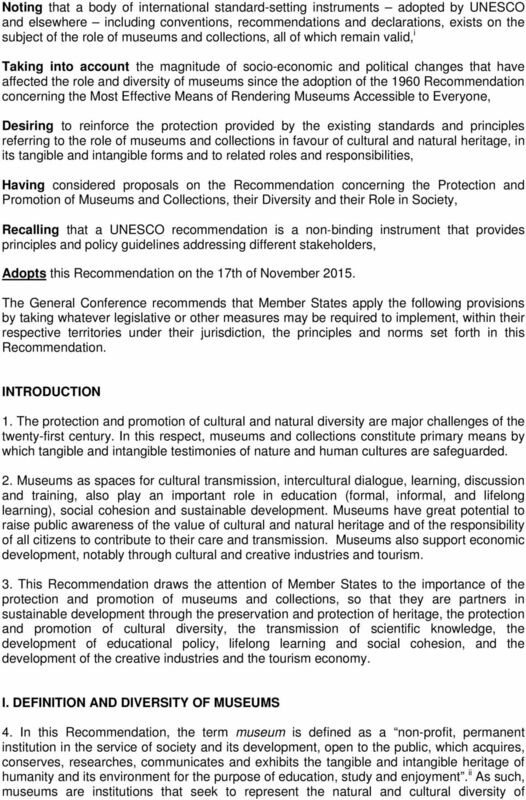 Member States should take appropriate legislative, technical, and financial measures, in order to design public planning and policies enabling to develop and implement these recommendations in museums situated in the territories under their jurisdiction. 34. 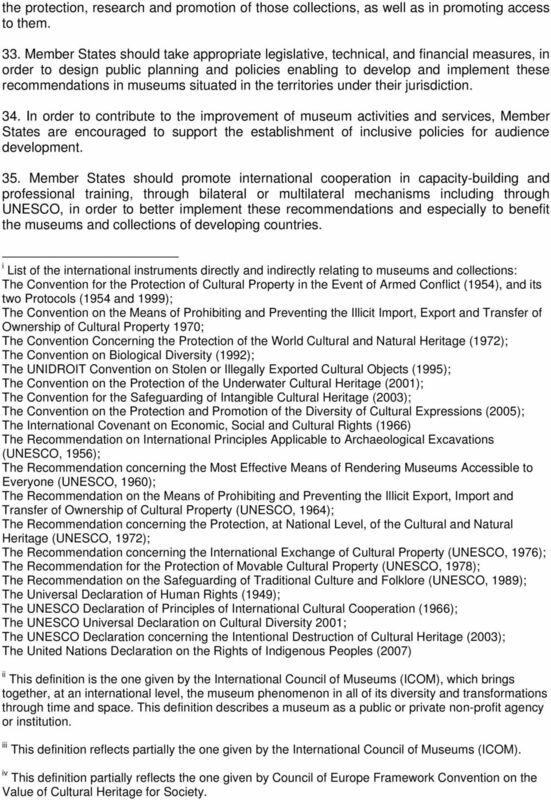 In order to contribute to the improvement of museum activities and services, Member States are encouraged to support the establishment of inclusive policies for audience development. 35. Member States should promote international cooperation in capacity-building and professional training, through bilateral or multilateral mechanisms including through UNESCO, in order to better implement these recommendations and especially to benefit the museums and collections of developing countries. i List of the international instruments directly and indirectly relating to museums and collections: The Convention for the Protection of Cultural Property in the Event of Armed Conflict (1954), and its two Protocols (1954 and 1999); The Convention on the Means of Prohibiting and Preventing the Illicit Import, Export and Transfer of Ownership of Cultural Property 1970; The Convention Concerning the Protection of the World Cultural and Natural Heritage (1972); The Convention on Biological Diversity (1992); The UNIDROIT Convention on Stolen or Illegally Exported Cultural Objects (1995); The Convention on the Protection of the Underwater Cultural Heritage (2001); The Convention for the Safeguarding of Intangible Cultural Heritage (2003); The Convention on the Protection and Promotion of the Diversity of Cultural Expressions (2005); The International Covenant on Economic, Social and Cultural Rights (1966) The Recommendation on International Principles Applicable to Archaeological Excavations (UNESCO, 1956); The Recommendation concerning the Most Effective Means of Rendering Museums Accessible to Everyone (UNESCO, 1960); The Recommendation on the Means of Prohibiting and Preventing the Illicit Export, Import and Transfer of Ownership of Cultural Property (UNESCO, 1964); The Recommendation concerning the Protection, at National Level, of the Cultural and Natural Heritage (UNESCO, 1972); The Recommendation concerning the International Exchange of Cultural Property (UNESCO, 1976); The Recommendation for the Protection of Movable Cultural Property (UNESCO, 1978); The Recommendation on the Safeguarding of Traditional Culture and Folklore (UNESCO, 1989); The Universal Declaration of Human Rights (1949); The UNESCO Declaration of Principles of International Cultural Cooperation (1966); The UNESCO Universal Declaration on Cultural Diversity 2001; The UNESCO Declaration concerning the Intentional Destruction of Cultural Heritage (2003); The United Nations Declaration on the Rights of Indigenous Peoples (2007) ii This definition is the one given by the International Council of Museums (ICOM), which brings together, at an international level, the museum phenomenon in all of its diversity and transformations through time and space. This definition describes a museum as a public or private non-profit agency or institution. iii This definition reflects partially the one given by the International Council of Museums (ICOM). iv This definition partially reflects the one given by Council of Europe Framework Convention on the Value of Cultural Heritage for Society. PROPOSED FINAL DRAFT. Revised under the Auspices of the ICOMOS International Scientific Committee on Interpretation and Presentation. Cultural Preservation and Protection By Elizabeth A. Thomas-Hoffman For generations, the weavers of Africa have perfected the art of making blankets and cloth in complicated patterns and vibrant colors. Discussion Paper. This document is intended to nurture the debate of the informal Council of Ministers meeting in Turin on the 24 September. Final report and recommendations of the OMC Group on Mobility od collections to the European Commission and Member States. OUTLINE. Source: 36 C/Resolution 16, 190 EX/Decision 9 and 192 EX/Decision 6. SUMMARY. This item has been included in the provisional agenda of the 196th session of the Executive Board at the request of Austria and Italy.